Grady, the owner of Wind in the Willows Nursery, was referred to us by one of our long time customers, Tom Ogren of Allergy Free Gardening. Grady was not happy with the way his previous website looked – and wanted to have the ability to modify it himself. Over about a month’s period of time, we worked with Grady to setup the website with all of the needed requirements that he had. Today, he has approved of the website and it has been launched! We appreciate the business from Grady! 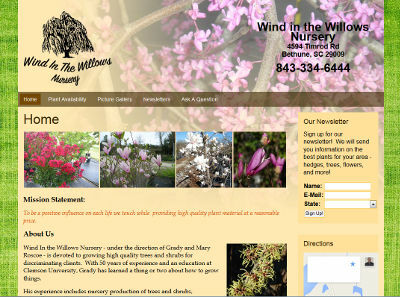 The Wind in the Willows Nursery website is at windinthewillowsnursery.com.